Prepare to Set Sail! Majestic bluffs, islands, Peninsula State Park and historic Ephraim await! Set sail aboard Scuppers, a vintage, one-of-a-kind sailboat and discover why Bella was chosen #1 Water Experience in Ephraim by Yahoo Travel for the 3rd year in a row! Daily 2-hour cruises depart at 10:30am, 1pm, 3:30pm and Sunset from South Shore Pier, Ephraim. Day cruises $35; Sunset $40 (24-hr cancellation notice required to receive full refund). Bring your own beverages, sit back, enjoy, relax! Whether you’re a first timer or a seasoned sailor, Captain Tom Schroeder of Bella Sailing Cruses welcomes visitors of all ages aboard Scuppers, a meticulously maintained, traditional mono-hull sailboat. With the beauty of the wind, you’ll set sail in harmony with the day’s prevailing weather and wave conditions for a relaxing and picturesque journey through Eagle Harbor. Bring plenty of sunscreen and your favorite refreshments. Even on a warm day, bring a windbreaker or sweater, as it’s always cooler on the water. Upon arrival, park at South Shore Pier or the nearby Village Hall. Check in at the South Shore Pier stand 15 minutes prior to departure. Then, wait for your captain at the Bella Sailing Cruises sign. If you’re early, you’ll spot Scuppers returning from the previous charter! 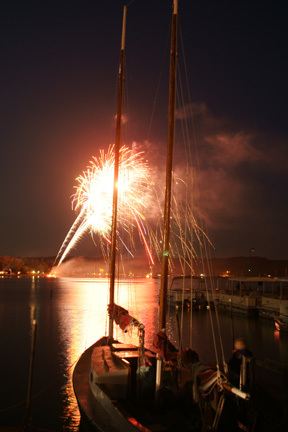 Eagle Harbor: Scuppers sets sail from the South Shore Pier in the heart of historic downtown Ephraim. Enchanting and pristine Eagle Harbor hugs the charming Ephraim shoreline. With Ephraim as its backdrop, this well-protected bay is a place for swimming, windsurfing, sunset watching and other Door Peninsula activities. Ephraim: Celebrating its 150th anniversary in 2003, Ephraim is one of the Peninsula’s oldest and most charming settlements. It encapsulates the essence of what the first settlers encountered when they arrived from the east to a coastline reminiscent of Scandinavian vistas. From the water, you’ll delight in the beautiful historic Ephraim skyline, punctuated with vintage clapboard buildings, majestic steeples and mature hardwood trees. Hear the Moravian Church bell toll a musical hymn, resonating off the surrounding bluffs. Recall what life was like when travel meant relying on a sailing vessel, the wind and the skill of a seasoned captain. Wildlife: Bella passengers will observe many water birds from soaring seagulls to splashing terns and cormorants. You may enjoy a rare glimpse of a white pelican, eagle or loon. For best viewing, bring your binoculars. Peninsula State Park: You’ll sail alongside Peninsula State Park, Wisconsin’s second oldest state park and the largest park on the Peninsula. Its 3,776 pristine acres include miles of hiking, biking and cross country skiing trails. The park’s majestic bluffs, including Eagle Bluff, reach 180 feet high. Vacationers enjoy the park’s campsites along the water and in the woods and golfing on the park’s championship 18-hole course. You’ll pass nearby Nicolet Bay, named for Jean Nicolet, the first white man to visit Wisconsin. This is Peninsula Park’s beach area, and you may see campers enjoying canoes, kayaks or small watercraft. Niagara Escarpment: On your Bella Sailing Cruise, you’ll have a unique view of intricate cave formations in the scenic Niagara Escarpment--a bedrock ridge made of dolomite rock running for 650 miles from New York through the Door Peninsula and into southeastern Wisconsin. 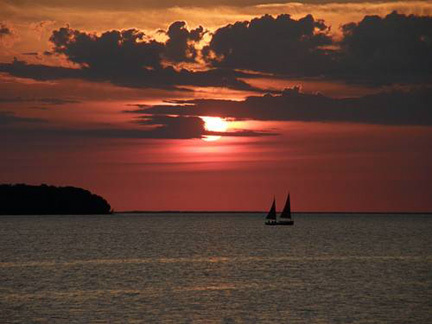 Horseshoe Island: Weather permitting, you’ll sail within view of this 39 acre island, about two miles from Nicolet Bay. This uninhabited state-owned island was formerly called Eagle Island, but renamed for its unique horseshoe shape. From the moment you meet Captain Schroeder, you’ll feel right at ease and know that your safety is his first concern. Tom prides himself on return passengers, many of whom have reserved their annual sailboat ride since 1993. Enjoy the camaraderie knowing that you’re in the hands of an experienced sailor. The captain’s love of sailing emerged when he was a little boy, admiring a painting of a sailboat in the family room. The boat and the way it appeared to move with the power of the wind mesmerized Tom. A sailboat from his grandfather became Tom’s favorite toy in the backyard pool. Later, Tom’s dream took shape as he watched the television series, "Adventures in Paradise," which aired 1959 through 1962. "Yes, this is my dream come true, the one guy and a boat ’Adventures in Paradise ideal," Captain Schroeder says. Captain Schroeder came to the Door Peninsula from Villa Park, Ill., in the late 1960s. He embellished his college education in history, education and political science by learning to sail and earning his captain’s license. After working for a catamaran business for seven years, Captain Schroeder chose to follow his dream and bought Bella Sailing Cruises in 1999. "Sailing does this for me! The world leaps into my eyes and ears, touches me, and afterward I return to the mainstream of my life renewed." Trips depart daily from South Shore Pier in the heart of downtown Ephraim, one of the Door Peninsula’s most charming settlements. Captain Schroeder sets sail four times daily for the 2-hour sailboat rides. Choose from 10:30 am, 1 pm, 3:30 pm or sunset departures (check with the Captain for exact departure time which is synchronized with the daily sunset). Bella Sailing Cruises are available daily throughout the season, running from Saturday, May 24, 2003 through the Sunday after Labor Day--September 7, 2003. Thereafter, call for weekend availability through September 28, 2003. Reservations for 2004 are accepted beginning April 1, 2004. Gift certificates are sold by phone year round. Call for details, 920/854-BOAT (2628). Make your reservation today for a sail you’ll remember all year-long! Reserve early by calling 920/854-BOAT (2628)! A sail with Bella Sailing Cruises makes a wonderful gift for the person who needs to relax, get away from a stressful metropolitan area, or see the Peninsula in a different way. And anytime is an ideal time to give the gift of a summer sail. Call for details, 920/854-BOAT (2628). Girls’ day out? Family reunion? Time for the two of you to just get away? Bella Sailing Cruises is a small, privately owned company. We can customize a sail to your needs. Just let us know how we can make your sailing experience special, 920/854-BOAT (2628). What is the wind like on the bay? The prevailing winds are southwest at 10 to 15 knots. But the direction can vary as the weather changes. Captain Schroeder loves sailing here and has ample experience in various conditions. On your sail, the water depth will vary to 175 feet at the deepest point. Captain Schroeder prides himself on putting your safety above all else. Safety gear on board the boat exceeds all Coast Guard regulations. The sailboat, equipment and safety devices pass annual Coast Guard inspections. Life jackets or personal flotation devices (PFDs) are always available, and the choice to wear one is up to each adult passenger. Most adults choose not to don them due to the stable nature of the sail, and the PFDs are always within reach. However, the Captain does require all children wear a PFD at all times in accordance with Coast Guard guidelines with the exception of infants who are hand-held by adults. Please discuss your family’s situation or questions with Captain Schroeder. All sizes of PFDs, from infant through adult, are on board. An avid swimmer, Captain Schroeder maintains current certification as a Life Guard and is a certified swimming instructor through the YMCA, where he teaches youth and preschool swimming lessons during the off season. Can I swim during the sail? Swimming is not permitted from the sailboat at any time. Even the strongest swimmer would be unable to keep up with the boat while under sail, potentially causing danger to the swimmer and others on board. Additionally, off shore water temperatures are known to cause hypothermia, a life-threatening condition. So, enjoy your swimming instead at one of the Peninsula’s beaches. Captain Schroeder studies the weather and wind reports as he makes decisions about each day’s sails. In threatening weather, Scuppers will not set sail. Have you ever married anyone? Captain Schroeder can officiate a marriage, but he hasn’t yet. Couples have become engaged during a sail on Scuppers. Others celebrate anniversaries. A passenger once spread the ashes of a loved one. We’re proud to earn this publicity in the "Door County Advocate’s" "This Week" section. Tom Schroeder shares his lifelong love of sailing with passengers aboard his boat, Scuppers. Tom Schroeder’s dream has come true. As a kid, he sat in his family’s living room, admiring a painting of a ailboat, not just the boat, but how it appeared to move with the power of the wind. His grandfather nurtured the interest by buying a toy sailboat that Schroeder played with in the backyard pool. Later his dream took shape as he watched the television series, "Adventures in Paradise", which aired 1959-1962. "Yes, this is my dream come true, the one guy and a boat ’Adventures in Paradise’ ideal. But I’m always looking for a bigger boat," Schroeder said with a laugh. Schroeder is the owner of Bella Sailing Cruises in Ephraim. He is also the captain, delighting passengers with his knowledge of Door Peninsula history and sence of humor while impressing them with his sailing skills. Schroeder is beginning his fourth season with Bella, a company that was named by its first owner who was stationed in Italy. Bella means beautiful in Italian, and the sights one sees while sailing along the Door Peninsula are truly that. Originally from Villa Park, Ill., Schroeder came to the Door Peninsula in the late 1960’s, seeking a simple life and a "back-to-the-land" ideal. In 1975, he purchased a 20-acre farm in Gibraltar and has been there ever since. He embellished his college education in history, education and political science by learning to sail and earning his captain’s license. Schroeder worked for a catamaran business for seven years before deciding to buy his own business in 1999 and follow his dream. Schroeder said one of the attractions to purchasing Bella was the sailboat Scuppers, which was handmade by the Chicago Boy Scouts in 1960 from fiberglass with warm pine and mahogany trim. Scuppers was actually named by the daughter of another Bella owner, who was inspired by the children’s book "The Sailor Dog." The sailboat is 26 feet long with a main sail that reaches 34 feet high. It accommodates six passengers and travels at 7 knots, - about 8 1/2 miles per hour. Schroeder said a great deal of preparation is done each season to get Scuppers ready to sail and earn local Coast Guard certification. "I totally repaint and revarnish Scuppers every year. I’m handy," said Schroeder, who is a farmer and carpenter during the off-season. "Then Scuppers goes into the water to ensure all systems are working." During four two-hour trips each day on Green Bay, Schroeder points out key sites and tells relevant Door Peninsula history stories. Scuppers sets sail from Eagle Harbor with the pretty Ephraim white skyline in view. Historical records show that since the 1850’s, when the early Moravians settled in the village, an unwritten law requires that buildings in Ephraim be painted white or be left unpainted. The sail continues alongside Peninsula Park’s scenic shore. Peninsula is the second oldest state park in Wisconsin, and the largest on the Door Peninsula with 3,776 acres, Schroeder tells passengers. He goes on to describe the park’s 180-foot high Eagle Bluff and points out the silhouette of an Indian in the cliffs. 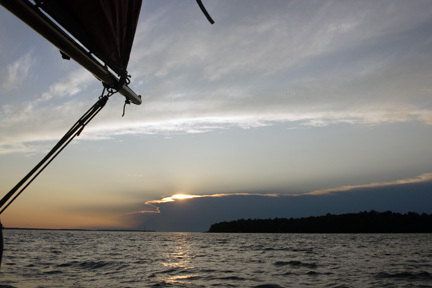 A sail on Scuppers passes through Nicolet Bay, named for Jean Nicolet, the first white man to visit the state of Wisconsin. "He came to shore there and fired gun, impressing the Indians," Schroeder points out. 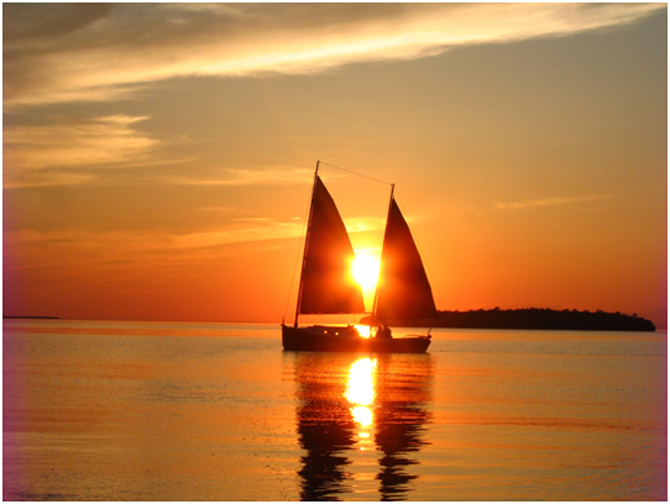 Weather permitting, Schroeder likes to sail Scuppers out to Horseshoe Bay Island, about two miles from Nicolet Bay. "Whenever I can, I try to get out of the harbor, even if we have to motor out, and get out to Horseshoe Island. It makes the sail a lot more pleasurable." Horseshoe Island is a 38-acre island once called Eagle Island but renamed because of its shape. A trip to Horseshoe requires the right weather conditions as swells can develop once the boat hits open water beyond Nicolet Bay. And what about the winds of Green Bay? Schroeder said that is a common question from passengers and one he answers with enthusiasm. "There is no general wind. The prevailing winds are southwest at 10 to 15 knots. But the weather changes constantly. And the wind can come from another direction. Green Bay and Long Island Sound are the two best places in the entire nation to sail," he said. Another question he often gets from the passengers is, "What is the depth of the water?" "I have fun with them on this one, telling them it’s deep enough; truly, it never gets over 175 feet in its deepest point." Schroeder said that although the goal is to have fun and keep the sail interesting, the top priority is safety. Life jackets and flares are available, and the captain ensures Scuppers passes Coast Guard inspections. Schroeder practices good sailing skills, which he described as weather knowledge, physical skills as well as natural instinct. "The ability to anticipate is the major thing. Being able to see what the clouds are doing, the skies are doing. See what is happening on the water. It’s also important to be honest with yourself. I cannot out-fight nature. I am not better, stronger. Let nature rule what your business is going to do. Accept it." Schroeder said he listens to the Coast Guard radio and the wind report from Sturgeon Bay as he makes decisions about each day’s sails. And while on each sail, he pays close attention to how his passengers - many of whom are visitors to the Door Peninsula - are reacting to the waves and the water. "Most of the people who sail with me have never sailed in their life. I read them, watch them. If a wave comes from a direction that makes them uncomfortable, I’ll change the direction of the the route," he said. EM>Schroeder easily recalled some of his more unique sails. "A guy proposed on the boat - we made sure they were the only people on that sail. I took care of obtaining wine and hors d"oeuvres - and having them on back so she thought it was going to be a normal sail. And another passenger once spread the ashes of a loved one. I haven’t married anyone yet, but I can, as a captain," he said.